Pattern: By Whitney Van Nes. Made For: My coworker, Jen’s, first son: Lucas Thomas, born January 20, 2010. Spud & Chloë yarn is so soft and wonderful — it was a delight to work with. I only knit a simple square with it, but at least it knit up quickly. Four skeins didn’t produce a very big body and the yarn cost more than I would’ve liked to spend. I found a cheaper, but still lovely, yarn from S.R. Kertzer for the border. 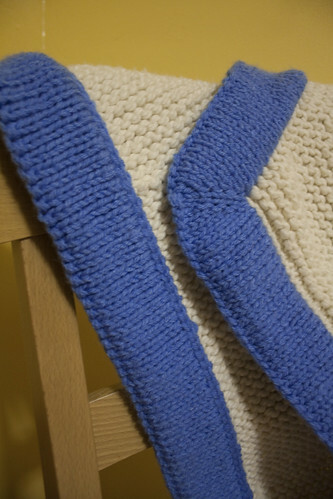 This made it more affordable for me to double the number of rows in the border in order to give the blanket a little more width. I was worried about creating the mitered corners, but they turned out very nicely! I also had to tackle picking up stitches around the whole edge of the blanket, and then again to “close” the border — thank goodness for crochet hooks. I love the finished piece, and I hope Lucas does, too! If you’re on Ravelry, you can view full details here. You can also view all of my photos here.